Several years before he passed away, Shihan Ron Forrester, the Father of Canadian Jiu Jitsu told me he thought I never really liked the hip throw because I was too tall and couldn’t get under most people’s centre of gravity to enable me to do a proper lift. I have seen people stretched in height pop smaller uke up on their hips with ease so maybe, in my case, my inabilities are due to lack of some skill mixed with a slight dash of laziness. At least these days. Under Forrester’s tutelage, you practised hip throws back and forth until it was hard to tell where your skin ended and the surface of the mat began. I still recall, decades before switching over to a cow friendly diet, devouring a porterhouse steak, one of those old time meat waffles that were so big they hung over the sides of the plate, then going out to train on a hot evening in July. Try hitting the mat countless times while digesting that baby. Seriously, I don’t think I’d try to convince a neophyte in self defense to rely on a hip throw, even if an attacker came in on her directly from behind and she didn’t have to execute the necessary pivot. We all know that there are simpler methods in the self defense arsenal. But that’s where my trepidation ends. 1. Turning your back – like any technique, the hip throw has to be practised in order to work, either in a Judo competition or in self defense. I’ve seen Judoka and Jiu Jitsu people repeatedly work on just the entry, like a Kata, without a partner, hundreds of times…left, right, left, right…until the movement into the pivot becomes as natural as breathing. The tops of their uniforms will hang out over their belts; sweat will be pouring on the mats; but they won’t cease until the motion turns into one smooth ride. A naysayer might still object: “So much effort to defend yourself. I’d rather just poke the bloke in the eye!” (I reside in Canada…I’m imagining someone raising this “poke the bloke” complaint somewhere in the U.K.). I’m not sure if any reader has ever been swept up by a tornado. The sensation of utter helplessness as a good Judoka whips you into his version of a twister must be just the same. And it is performed with lightning speed. And it is overwhelming. The turning of the back, along with the torque, is a weapon in itself. The action can slam into the attacker’s body, leaving him helpless. An addendum: in combative Judo, and in Jiu Jitsu, we may begin with a poke in the bloke’s eye…then whirlwind him with a hip throw as an intermediary or finishing technique. 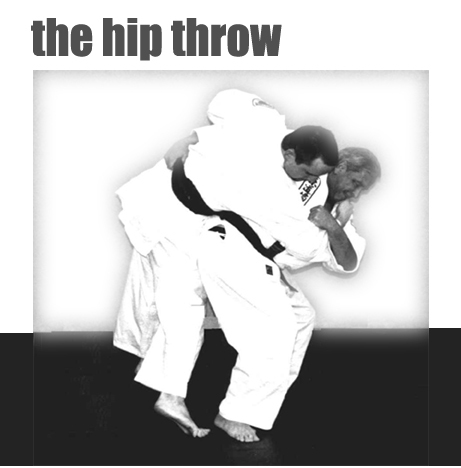 So the hip throw itself may not necessarily be the starting point of a defense. My final recommendation: if you enjoy the throw, and you become fairly good at it, then add it to your defensive arsenal. Now you have two weapons, the hip throw…and the poke in the eye. 2. Weight and size differentials – from my experience, I’ve found that Jiu Jitsu people who are shorter than their uke may have an easier time since they can enter rapidly from underneath, pivot on a dime, with their hips often below the hips of their opponents. As long as they possess solid technique; good timing; the correct position for the legs, hips and back; and excellent coordination between the lift and the downward spiraling throw. Again, skill and experience matter. 3. Multiple attack situations – any technique becomes a limitation if you hang on to it for dear life in a fluid combat situation. Far from turning into a quick weapon, the hip throw can get you tangled up with one opponent while the other attackers close in. But the same can be said of a punch, or a side kick. The vortex that a fast hip throw creates can be advantageous. You can throw the one attacker into the others; you can use him as a human shield by propelling him while quickly shifting off at another angle; you can throw him against a wall, into a chair, etc., creating havoc in the minds of the other attackers. Most miscreants out there don’t know how to breakfall so the results of a hip throw may be enough to make the other assailants change their minds. Here’s a video clip which provides us with a good example of the hip throw technique. When I teach the Jiu Jitsu version of the hip throw, we start with a punch or a kick first. This buys us the time to enter into the throw. Good Judoka may just tear right into the throw itself with excellent results. I stress jutting the hip out a bit to the side with the legs not too far apart. I also like to see the back fairly straight. We emphasize a bent knee approach where the legs then straighten upward to do the lifting. Caution: problems may be experienced however during the vicissitudes of training, both for the uke and the tori. Poor timing and body alignment can result in meniscus tears in the knees when pivoting while bearing weight. Leaning forward too far before lifting may result in back injury. For the uke, injuries can occur when the person who performs the throw holds on too long or just doesn’t let go of tori’s body or falls right on top of her without tori having a chance to properly break her fall. No Karate or Kung Fu people should be forced to sit on the sidelines when it comes to the hip throw. The hip throw is very much a part of your repertoire of techniques. The hip throw can be a very effective technique. But again, like all techniques in self defense, the hip throw must be practised on a regular basis.